Microsoft (NASDQ:MSFT) has quietly become the second-largest company in the U.S. by market cap, now trailing only Apple (NASDAQ:AAPL) in sheer size. Microsoft stock is up nearly 20% year-to-date and within shouting distance of the all-time high at $120.22. It is also approaching a trillion dollar market cap. Momentum can seemingly propel stocks ever higher, regardless of valuations. 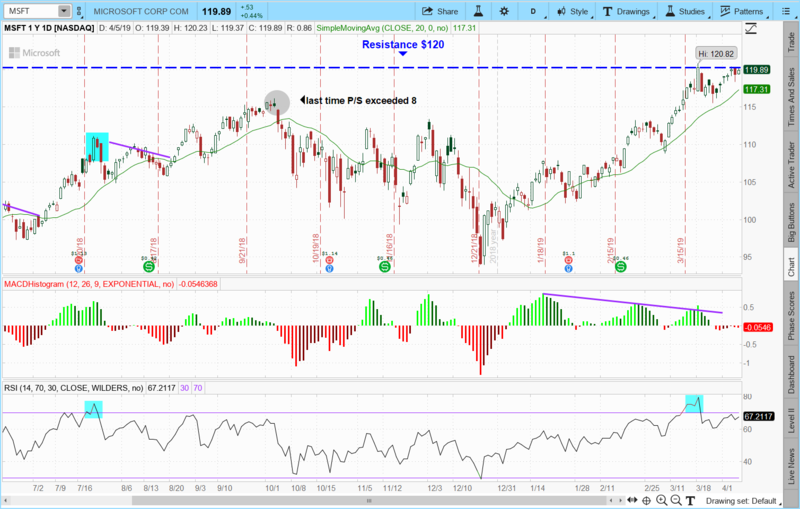 The recent price action in MSFT, however, indicates the red-hot rally may finally be coming to an end, which means it’s time to play for a pullback in Microsoft stock. The fundamentals for Microsoft are definitely flashing red. The price-to-sales ratio for Microsoft has exploded higher this year. It is nearing historic extremes once again at 8X. 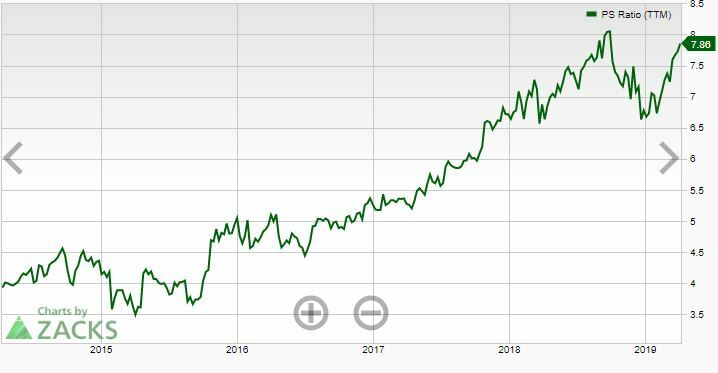 The last time price-to-sales reached such an extreme was late Septemebr of last year-which coincided with a major top in the stock price at $115. Price-to-free cash flow is at the highest levels of the past 10 years with a reading over 20. It is also at the largest premium to the S&P 500 cash flow in that time frame. Price-to-book just hit a new decade high of 10 and is at a massive premium to the five-year average of 6.3. These lofty multiples are usually reserved for emerging growth stocks and not for a nearly trillion dollar company. MSFT stock can’t be construed as cheap. Microsoft stock is certainly looking tired and toppy from a technical perspective. MSFT shares reached the highest yearly 14-day RSI reading above 80 recently before finally weakening. The prior two times this occurred marked a significant short-term top in Microsoft stock. There is major overhead resistance at the $120 level, which has been rejected the past three consecutive days. MACD is failing to confirm the latest moves higher, making a series of lower highs. MSFT stock is also trading at a large premium to the 20-day moving average of $177.31, which has been a precursor for a pullback in the past. Microsoft stock is overvalued fundamentally and overbought technically. Stock traders should look to short MSFT on any rallies. Option traders may want to consider taking advantage of comparatively cheap implied volatility (IV) and buying the at-the-money April $120 puts for $1.45. Break even is $118.55, or only 1.12% lower than the $119.89 closing price of MSFT. Earnings are due April 25, so the April $120 puts will expire before then to avoid any earnings-related risk. The post How to Approach Microsoft Stock As the Rally Softens appeared first on InvestorPlace.